PLEASE view all of the product images above and read the following description. ★ THIS DIGITAL LISTING INCLUDES A 5X7 INVITATION AND EDITING INSTRUCTION GUIDE. ★ TRY IT BEFORE YOU BUY IT! 3. DOWNLOAD YOUR EDITING INSTRUCTION FILE — You will receive 2 emails. One from Etsy with a link to download an Instruction Manual to help with the editing process. The other will be from Templett.com and will have a button to click which will open your design in your browser. Check your spam/junk mail folder if you don’t see these in your Inbox. 4. 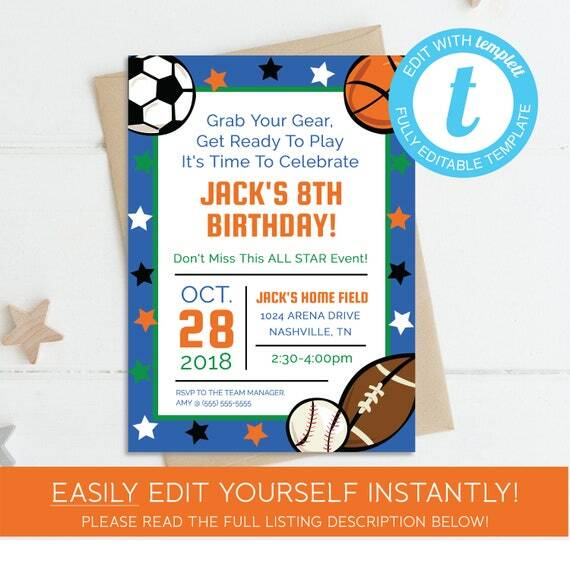 EDIT, SAVE AND PRINT YOUR FILES — Editing on Templett.com is very quick and easy! You won't have to download any software or fonts and you will have the ability to download your design as a PDF, JPEG or a PNG; OR all 3! You can even change SOME text colors, resize graphics, move them around and more! **You WILL NOT be able to change the colors of the graphic elements. The downloadable instruction manual will walk you through the process. 5. SEND OUT YOUR INVITATIONS AND HAVE A FABULOUS PARTY!! PRINTING: PRINT SHOP, OFFICE SUPPLY OR AT HOME?? This is totally up to you but here's my two cents; I always recommend professional printing because it will produce the very best results and doesn't necessarily cost you any more considering what you will spend on ink, paper, envelopes, etc. Printing at home can end up being a hassle, especially if you don't have a laser printer. Color heavy designs will use tons of ink if you are printing on ink jet and the graphics won't be as crisp. Office supply stores often produce less than desirable results. They tend to use flimsy cardstock and colors don't always look nice and bright. • Your design can only be edited on computers, not on mobile devices. • All editable text uses fonts that are embedded. No font download is required. • You can save your files and come back to the web app and continue editing you template. Templates are available for 30 days before they expire. • Due to color variations in computer screens, there may be slight differences in the color that you see on your monitor and that of the final print. CAN YOU DO THE EDITING FOR ME? • Due to the nature of digital downloads, all sales are final. NO CANCELLATIONS! • PERSONAL USE ONLY! You may print the files for yourself as many times as you need, however, you may not share the files with anyone. Resale or commercial use of any kind is not permitted. Please respect our work.